Device for traffic control FOTON is a modern microprocessor device, designed according to the concept of modern industrial controller and according to the modern European equipment manufacturers transport regulators. The device is an original product of 'Selma' from Subotica and approved by the "TÜV Rheinland". When designing the device, determining its function, the device performance and the selection of components was carried out in accordance with the applicable standards and regulations, as well as recommendations and valid trends in the world. The device is designed with the aim to meet the needs of future generations of traffic control devices. These are: reliability, multi-functionality and the ability to operate in a network (network traffic controller). The device itself can be associated with a variety of detectors, increasing the functionality of the controller. In order to provide these features FOTON contains a number of innovations related to the functionality and application of new technologies. The open architecture of the device is achieved by applying the most modern technical solutions. The device is modular, with clearly separated functional units. it allows maximum adjustment of the device requirements that apply to a given physical location, without installing those functional parts (modules), for which there is no need at the given place. Subsequent extension of the devices for the given function is easily feasible. Easy connection of the devices to various forms of cable and radio coordination in the local or central network control (cable or wireless) or the remote control (modem or GSM) is provided. The possible obsolescence of certain technical solutions in the future will not require replacement of the entire unit, but only the functional units (blocks or modules). Users of the device require the possibility of easy programming and adjustments, easy control operation and diagnostics. 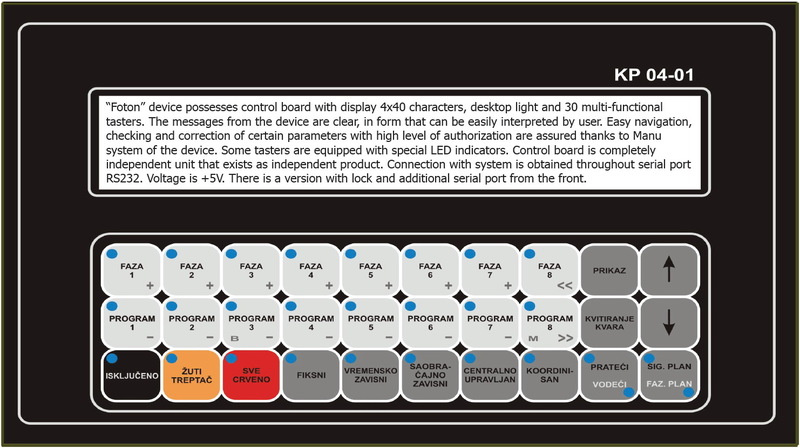 The device has a control panel with a display of 4x40 character, backlit, and 30 multi-function keys. Messages given by the device are clear, in a form that is easily interpreted by the operator. 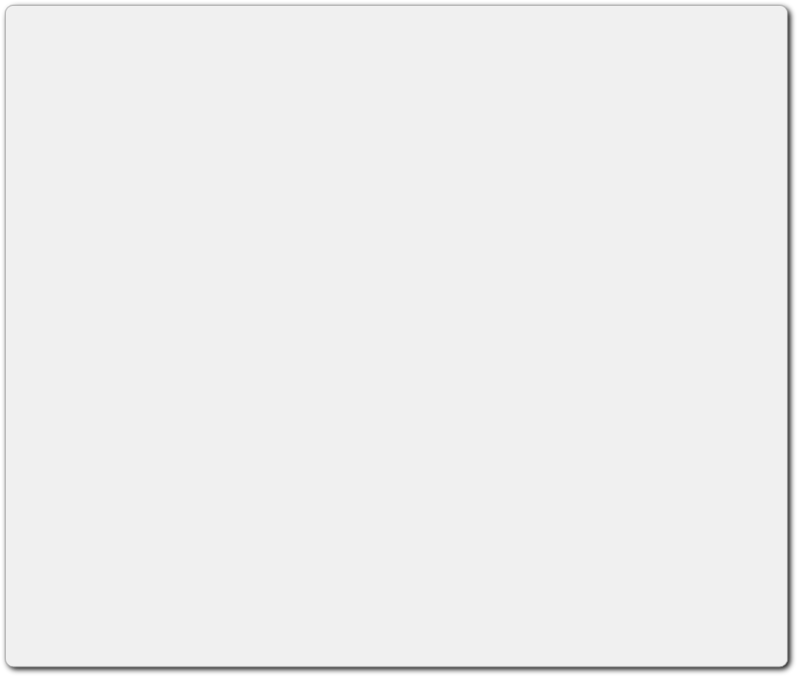 Easy navigation is enabled in device menu system as well as checking and modification of certain parameters, with multiple levels of authorization. The design of the FOTON device provides easy access to maintenance personnel. Installation of the module to the rotating frame system allows an easy check of wiring and access to the hidden areas of the device. Output (lamp) fuses are placed in the output modules, and so the time for an intervention by the maintenance personnel has been reduced to a minimum. Operational safety is achieved by controlling certain traffic parameters (clearance interval, conflict situations) and the bulb (burning out or the appearance of illegal (indirect) voltage). The control is done on several levels. The basic functional safety is achieved by physical construction of the device. 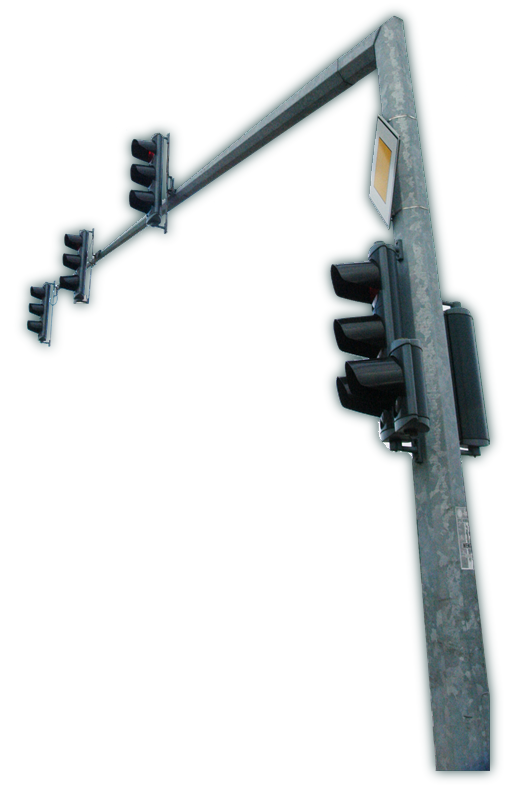 Modules that are critical to the operation of traffic lights devices are of microprocessor design, and have the ability to detect basic functional irregularities. In case of detection of a fault in the functional units, the output (executing) modules are cut off from the supply voltage and thus the occurrence of unwanted voltage on signal lamps is prevented. The device does not perform signal plans, which are conflicting with respect to the table conflicts. State of the output signal is constantly checked and compared with the signal plan. In the case of disagreement adequate protection is provided. Protection measure depends on the type of error. Traffic controller has a system monitor. 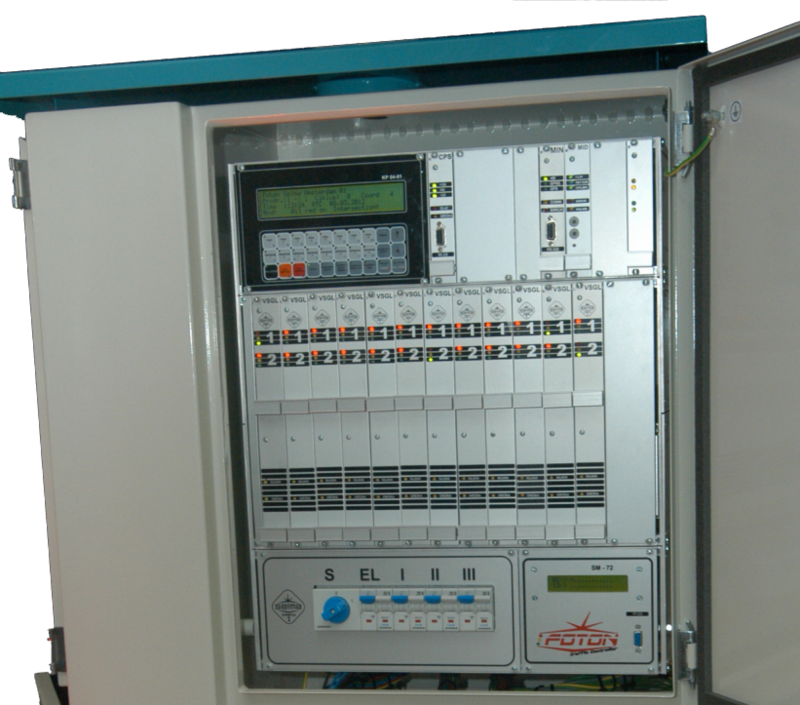 The system monitor is fully autonomous unit with its own power source and is completely electrically isolated from the rest of the traffic controller. In addition to the functional control of the device the system monitor controls the green bulb output. It further checks the clearance interval and appearance of conflict situation. Internal design of the monitor system is different from the solutions of the central unit of traffic controllers and clearance interval table and conflicting routes are programmed independently of the central part of the device. Programming of the system monitor is only done on the spot, and by the authorized person, in the same way as other programmable devices all over the world. Thus, the system of protection provided against accidental or improper alteration of critical data over a communications line. Electrical safety is provided by wiring, assembly method, in accordance with standards and regulations. To create the device only selected components of renowned manufacturers were selected. Components that affect the proper operation of the device have been selected for the extended (industrial) temperature range, to fully meet the criteria that are set for extreme operating conditions. The housing of the device has the necessary protection against the ingress of moisture and dust IP 55. At the request, the device is supplied in a non-corrosion cubicle (lifetime warranty ), which has enhanced protection from break-ins (vandal proof) .